We are told that retailers are under increasing pressure and online shopping is reducing the demand for physical store Try telling that to the myriad developers constructing new retail and leisure space across London. According to Colliers International, there are nine major schemes opening across the capital in 2017/18, delivering more than 1.2m sq ft. Beyond that there are another crop of developments waiting in the sidelines ready to inject a further 5m sq ft of floorspace. “When you add on the smaller projects and infill schemes, that is a lot of development and we have not seen anything like that level of delivery in recent years,” says Colliers International’s head of retail agency London, Paul Souber. Is that amount of development viable in the current climate? Agents and developers insist it is. The London consumer is still hungry for new brands and the boost in tourist numbers fuelled by the weak pound has given the market confidence to continue investing. Colliers has added around 400 retailer requirements to its London tracker since the beginning of the year and new retail hubs within mixed-use regeneration projects are providing the type of environments that occupiers are now seeking. The future of physical retailing is intrinsically linked to placemaking and integrating uses to create a vibrant destination. Justin Taylor, Cushman & Wakefield’s head of retail EMEA, says: “Mixed-use development is such a strong formula in drawing people in. “As long as developers get the offer and the mix right, they are a very appealing prospect to both retail and leisure operators. A £400m joint development project by Cain Hoy and Sager Group, Islington Square (main picture) will incorporate 170,000 sq ft of retail and leisure with 263 homes, 108 serviced apartments and a theatre. Due for completion in autumn 2018, the scheme is designed to lure occupiers with space at the heart of one of London’s most affluent boroughs. The 4.5-acre development sits on the site of the former North London Mail Centre and its Edwardian heritage is being carefully restored by CZWG Architects’ designs. Its appeal has been further boosted by prelets to three anchors guaranteeing an all-day leisure offer. Third Space is to open a 47,000 sq ft gym, Odeon has signed for a six-screen cinema and Islington’s King’s Head Theatre will move into a new 250-seat auditorium. The scheme is accessed by two new arcades opening out on to a tree-lined boulevard and it is hoped retailers will want to exploit its leisure draw and well-configured units that they might struggle to find on the existing retail pitch. Islington Square includes 35 restaurant and leisure units and Barber says around 70% of the space has already exchanged or is under offer. Barber says: “Letting anything at the moment is not easy, but retailers know shops trade well in Islington and they will be surrounded by successful brands. The transformation of King’s Cross will reach another milestone next year when Argent opens Coal Drops Yard, its £90m shopping quarter. The developer is looking to exploit the character of the scheme’s industrial buildings to create a unique 100,000 sq ft retail and leisure hub. Designed by Heatherwick Studio, Coal Drops Yard will breathe new life into a site that was constructed in the 1850s to handle coal following its journey from the North of England. The Victorian brick arches will house up to 65 units for fashion, craft and culture retailers. For White, the priority is to attract “artisans and icons of design and fashion” and a year before opening, Argent has exchanged on or is in negotiations for around 65% of the floorspace. The largest retailer to commit so far is British design brand Tom Dixon, which will move from its current home at Portobello Dock to create a 17,500 sq ft flagship store. Fashion retailers 18montrose, Cubitts and Lost Property of London have also signed up, taking around 6,800 sq ft of space between them. Argent hopes the scheme’s distinct character will attract a mix of established and emerging retailers keen to benefit from the 20m people it estimates will visit the area each year. In terms of food and beverage, the scheme will incorporate a restaurant, two cafés and a bar. White concedes the proportion of leisure is relatively low, but says there are plenty of food options available elsewhere in King’s Cross and many of the retailers will have in-store cafés. In order to attract the right tenant mix, Argent spent three years working with brands to formulate its leasing and rental structure. The result is a base rent plus turnover model that White says offers retail space at half the rent of Soho. The formula helps share risk and occupiers are being offered flexible lease lengths that range from one to 10 years. If you want evidence of faith in the resilience of the London retail market, look no further than the £600m extension of Westfield in White City, W12. 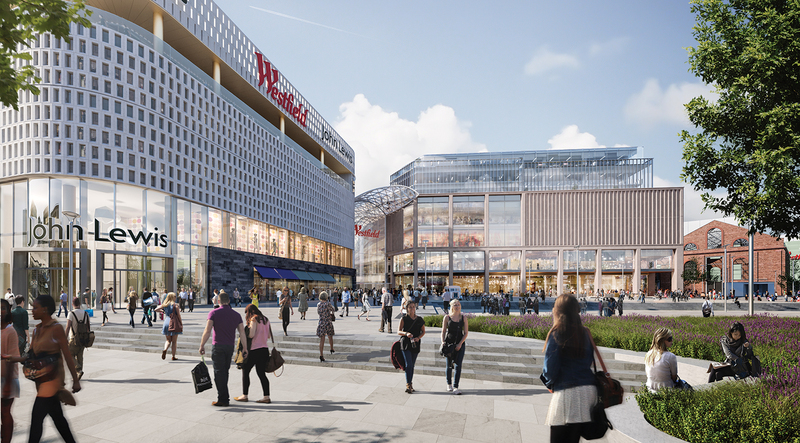 On the back of robust demand from both domestic and international retailers, Westfield has committed to creating the largest shopping centre in Europe. When the 740,000 sq ft extension is completed in March, it will take the centre’s total gross lettable area to 2.6m sq ft. It is expected to attract 39m visitors a year and build on annual retail sales of £1bn. Apart from a 230,000 sq ft letting to John Lewis and 22,000 sq ft to Chinese fashion brand Urban Revivo, Westfield hasn’t named any other occupiers. Bower says it is in negotiations for at least 80% of the space and hopes to announce a bumper list of lettings later this month. John Lewis gained access to its anchor store in July and there are rumours of a deal with Primark. Bower remains tight-lipped, but says discussions are under way with other retailers. Since Westfield opened its doors in 2008, the retail market has changed dramatically and Bower admits the need for a more experiential offer has also affected the scheme’s design, with phase two incorporating a greater proportion of F&B, leisure and open space. That quest to integrate retail and leisure into a mixed-use offer has been made easier with the development of the surrounding area. The White City Opportunity Area now supports a community of residential and commercial occupiers. Westfield has permission to build 1,500 residential units, and developments such as Stanhope’s Television Centre, Imperial College London and Berkeley Group’s St James will boost spending while creating a more appealing destination. Richard Scott, director at Nash Bond, is part of Westfield’s leasing team and says the area’s vibrancy is appealing to a greater range of occupiers.